THERE ARE FAIRIES IN THE MIDDLE OF MY KITCHEN …. 'MADAME AMERICA' HITS BERLIN ... Some like it heiss! Last night I went back to the delightful, atmospheric Bar Jeder Vernunft, the glamorous little tented venue which, in 2009, launched me so auspiciously on my now annual round of Berlin showbusiness (http://kurtofgerolstein.blogspot.de/2009/05/attention-deficient-goldfish-in-berlin.html). Somehow, I hadn’t been back there since that memorable night, but now all that is set right. 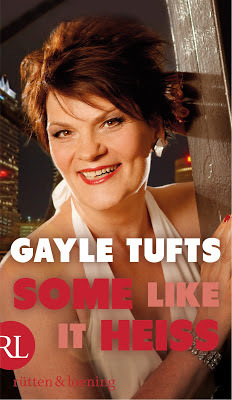 Ever since this city and its entertainment world became a fixture in my life, I have heard the name of Gayle Tufts spoken in every corner. An American comedienne and singer in Berlin. THE American comedienne and singer in Berlin. Germany’s ‘Miss America’. Or ‘Madam America’. But it has taken me until now to actually see her in performance. Ms Tufts’ evening, Some Like It Heiss, is a classic, fun-filled mixture of stand-up comedy, fine monologue material, and zippy songs. And the lady herself a statuesque, twinkling dame who doesn’t look nearly old enough to be joking about the menopause. She delivers her material in a rich, clear contralto: mixing German with sprigs of American in such a way that even folk like myself, with a limited acquaintance with the German language, can understand the humour. And it is that genuine type of humour, based on real life and personal experience, and not just a collection of joey-joeys. Friendly humour, likeable humour. The best sort. The musical part of the evening (accompanist: the enjoyable Marian Lux) was just as successful as the comic and just as personal. Great to hear original material, rather than ‘Don’t Rain on my parade’ or ‘I’m still here’! And delivered with ringing panache. Great to hear someone taking the mickey out of the oh-so-trendy Brecht/Eisler tradition. Great full stop. Has anybody yet cast this lady as anything from Dolly and Mame to Mrs Peachum? So, a grand return, for me, to the Bar Jeder Vernunft, and a grand introduction to ‘Madam’ Gayle Tufts and her thoroughly ‘hot’ show. Those who like it ‘heiss’ will love this! I did. Today, to the Staatsoper. To see a ‘partly-opera’, by name Aschemond. Aschemond? A mixture perhaps of Aschenbrödl and Frau Luna. Oh no. Much more of a mixture than that. Shakespeare and Purcell stirred in (advertisedly) with a non-book and 21st century music by Helmut Oehring. Sounded like a dangerously 1980s University student cocktail. And what is this? … mixed in also with Sylvia Plath! Mon dieu! The trendy idol of the 1980s University crowd. How old fashioned! Oh dear. It seemed I was in for a horridly pretentious afternoon. Well, it didn’t turn out quite like that at all. When a piece cannily advertises in its programme that it has a non-book, you can’t criticise it for that. In fact, it sort of did have an outline: a series of glimpses back in time by a young man theorising on his crazy, sexually immature, repulsively self-centred mother’s alcoholic suicide. Ms Plath, I imagine. However, someone wanted to use Purcell’s songs, and Herr Oehring obviously had his settings of Shakespeare’s sonnets in his bottom drawer, so the whole lot was turned into German text by Stefanie Wördemann, and voilà; the non-book. The partly-opera. With fairies in the kitchen. I’m not sure why. But they were nice fairies and looked and sounded grand ..
Aschemond certainly didn’t claim to have a non-score. In fact, it has a grand one. The mixture of Purcell’s music and Oehring’s modern tones worked magnificently. I waited expectantly to feel uncomfortable, but I didn’t. 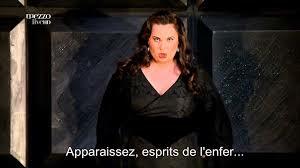 Which was a miracle, in two and a half hours WITHOUT an interval. The only bit of new music I didn’t like was the dirge setting of ‘Shall I compare thee to a summer’s day?’. By the time the singer got to the last syllable of his (English) word, you had forgotten what the first syllable was. And, sorry Mr Purcell, the musical highlight of the night for me was the contralto showpiece in ‘Autumn’. By Oehring. The staging, too, was a surprise. Looking at the photos before the event it looked like a boring box set. Well, the box set turned endlessly (perhaps too much) producing a seamless action, and in spite of the ‘non-story’ requiring the same scene to be repeated several times, only in the last half hour (when people began walking out of the audience) did it, with its deliberately slow pace, begin to drag. I see from the libretto that cuts have been made. More are needed. And an interval. Otherwise the slow pace becomes oppressive. The cast sang their two kinds of music well: Tanja Ariane Baumgartner (contralto) got the bon-bon of the new score, Bejun Mehta (counter-tenor) the best of the Purcell. Marlis Petersen (soprano) as the mother did well in both, but one was so irritated by her smackable character that one just wanted the wretched woman off the stage. A feature of the show was the written-to-order role of the housekeeper, played in sign-language by the non-hearing actress Christina Schönfeld, in a show-stealing but necessarily non-singing role, and the central grown-up little boy, the narrator, was played beautifully by Ulrich Matthes, in the crispest clearest actor’s voice I can remember in years. I could go on giving ‘credits’ here for miles. They fill six pages in the programme. Two orchestras, instrumental soloists, two conductors, dance staff (although the dance element was absolutely pasted in), designers of this and that, etc. But for a new piece, I think the piece deserves the attention. I hope they work on with Aschemond. More trimmings? Perhaps a bit of an attempt to make the central woman less Plath and more sympathetic, a new setting of ‘Shall I?’ and cut the totally unnecessary choreography. And without doubt, put in an interval. Oh, and for the ordinary audience’s sake: kill that claque in the back row. And then I think – pick yourselves up off the ground, you who know me -- I would like to see it again. I who, in 67 years, have never seen an even partly-modern part-opera a second time. And now, it’s stormingly in fashion. I came from Vienna to Berlin this week. It’s playing in both cities. At the Theater an der Wien in a staged version, and in Berlin in a concert version. The concert version is pretty surely the more viable, because, from the beginning, the libretto of Attila was regarded as being somewhere from unsatisfactory to awful. Cardboard characters in lego-plot action. The ‘Wildhorn trick’ existed in the 19th century already: take a famous title and stick a bundle of the same old stuff behind it. Well, the difference here is that Verdi’s ‘same old stuff’ isn’t all just stuff. His score throws up some beautiful bonbons – from the ‘celebrated War Song’ to the act three trio – by way of the pretty ‘dear daddy’ aria ‘Liberamente or piangi’ for the soprano, the basso showpiece ‘Mentre gonfiarsi l’anima’ and even the rather reminiscent but reasonably singable pasted-in megascena for baritone ‘Dagl’immortali vertici’. The war song is a lively bit of vigorous show-off music worthy of a Rossini finale, and it’s a joy to have a basso for the central character ... in fact, I couldn’t help myself thinking, I wish Verdi had gone the whole hog and made the boring, tenorious Foresto a contralto. You can’t blame Atilla’s ‘hit songs’ for its semi-eclipse; and you can thank those showy solos, if not much else, for the subsequent return to favour. Tonight I got my introduction to Attila, complete, at the Philharmonie. And I understood just why it has had a chequered life. The bits in between the pop songs – reminiscent choruses, vast duets, et al -- are just too ‘standard Verdi’ to be truly acceptable. But the pop songs are great fun. Tonight, the audience exploded twice. Rightly. In Odabella’s surefire War Song and in Attila’s big solo. Both in Act I. Which meant that the second half, in spite of the Act III trio, and the stabbing bit, was a bit of a fizzle. I came to the theatre tonight prepared to hear Erwin Schrott, my marvellous Leporello of last year, sing Attila. He scratched. Damn damn damn. And I could have seen Dmitri Belosselsy in Vienna! We got Roberto Tagliavini instead. Well. If that’s an ‘understudy’. give me understudies! I think ‘replacement’ would be a fairer word. This (very?) young man sang the role simply beautifully, dominated the stage, and only a little lack of weight in the lowest register stopped him from being wholly perfect. The house applauded him wildly and I was on my feet, cheering him. Which I don’t do often! The other triumph was the Odabella of Liudmyla Monastryrska. She pinged out the power-packed frills of her War Song, made a gem of her daddy song, and it wasn’t her fault that her role fades away into the conventional in part two. The opera as a whole does. A really fine performance. Massimo Giordano did what he could with the pale, uninteresting Pollio-Manrico part of Foresto without demeriting, and the even more boring part of Ezio was played by the same Dalibor Jenis whom I found ‘non-existent’ in last year’s concert Trovatore. He was non-existent (and occasionally imprecise pitchwise) again. The cellophane baritone. The comprimario parts, however, were excellently done. Ante Jerkuinca was a smashing Leone (watch for him) and Jörg Schôrmer an incisive, plump Uldino. And because they were only two, we didn’t have the usual anguishing parade of music-stands and scores and folk traipsing on and off the stage! Hurrah! The orchestra under Pinchas Steinberg was impeccable, and the chorus only irritating because they stood up and sat down distractingly, like oratorio extras, and sang music which sounded like leftovers from Nabucco. The concert format works well for this piece. But what can you do with a show with two uninteresting, too-conventional-to-be-true principal characters, and with its two blazingly best numbers in Act I? Probably sing those two numbers in concert. Which is what the Victorians did. Otherwise, I’d say. I think Verdi (and especially his librettists) wrote better operas. But you have to hear or see them all to know that. Which I haven’t. All I know is, I’d cross town any time, even at the renewed risk of running into an American president (a nice young soldier helped me round the barricades), to hear Tagliavini sing anything at all, and to hear that War Song again. I hummed it all the way home (‘Non piu me-he-he-he-sta…’).